Wallabies fly-half Quade Cooper has confirmed that he will make his debut in the boxing ring in February next year but is no nearer to ending his contract dispute with the Austalian Rugby Union (ARU). The 24-year-old will feature on the undercard of friend and former All Blacks international Sonny Bill Williams' bout with South African Frans Botha in Brisbane on February 8. 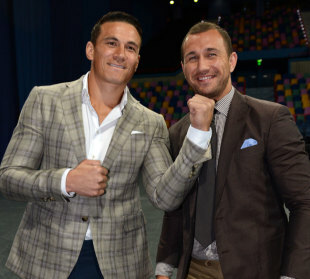 Unlike Williams, who juggles his rugby commitments with a career as a heavyweight, Cooper will fight at cruiserweight but his opponent will not be finalised until next month. Cooper, who is currently battling back from a knee injury, insists that he still wants to play rugby long term but talks with the ARU over a new deal have stalled with an incentive-based contract rejected by the playmaker. Cooper's manager Khoder Nasser revealed that there had been "a total communication breakdown" with the governing body in the wake of the player's outspoken comments regarding what he considered was the "toxic" Wallabies environment for which he was hit with a hefty fine and the further threat of a three-match suspension. Cooper agreed a new three-year contract with the Reds earlier this year and while he hopes to be able to fulfil that commitment, it is dependent on a satisfactory top-up offer from the ARU that is proving elusive. "Rugby is the game that I love," said Cooper. "For me the desire will never go and it's something that I hold close to my heart. My desire for rugby will never fade - but it's kind of out of my hand at the moment." Asked whether he could himself playing rugby for the Reds and Wallabies next year, Cooper said: "I can't see anything happening at the moment because all I have in front of me is the offer that I was given, and that offer is one that I've already said I won't accept and I haven't accepted." The fight date is eight days before the Reds' 2013 Super Rugby season-opener against the Brumbies and they clearly want to retain Cooper's services and appear to be leading the efforts for a resolution. "At this stage I've sat down and had lengthy discussions with (Reds chief executive) Jim Carmichael, he's been working very hard with our chairman Rod McCall and coach Ewen McKenzie to try and resolve the matter," said Cooper. "As it stands now I'm still contracted until the end of December, (but) I don't really have an option to continue forward with rugby union at the moment. So from now on I'm just focused on getting my body right, continuing my rehab, training still at the Reds as I'm still contracted there, and I'll just put my full focus into getting my body right for the upcoming boxing fight." Dual international Williams will fight Botha a month before he makes his return to rugby league with the Sydney Roosters having quit rugby union following a short stint in Japan earlier this year. And he is convinced Cooper could also shine in the 13-man code and even offered to relinquish 50% of his own earnings to allow the Roosters to sign him. "I have been one of his big supporters even before we joined up as a team and I have no doubt that he has got that ability to succeed in the 13-man game," Williams said. "I think there's reports coming out that no-one wants him and I think that obviously they are playing the media game that they have to play but I have been there when clubs have rung up and enquired about his services. "I would probably go as far as to say that I, myself, would give him half my pay packet to lure him across and they're not just words. I would really do that because I think he would be great not just for the game but great for our game as well. I definitely would."